Blaze Pro Ant Killer kills ants on contact and provides residual killing action for up to 60 days. Vaporizes into cracks and crevices for insect control. Pressurized space, crack and crevice, spot treatment and contact spray. Revolutionary new eco-friendly spray technology that uses air pressure and sprays in any direction, even upside down. When it comes to pest control, nothing beats Wilson! 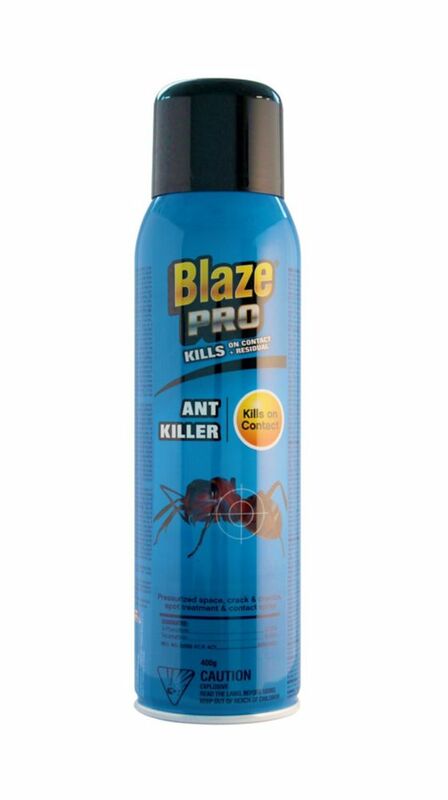 Blaze Pro Ant Killer Spray 400g Blaze Pro Ant Killer kills ants on contact and provides residual killing action for up to 60 days. Vaporizes into cracks and crevices for insect control. Blaze Pro Ant Killer Spray 400g is rated 3.0 out of 5 by 1. Rated 3 out of 5 by Frenchie from Does The Job...Eventually Bought this product yesterday and used it immediately. The "kills on contact" line suggests that the ants will die immediately. This does not happen. They will die but it will take some time. Also, the air propellant is too strong. It literally blows ants away. Overall a good product.